Trendy and tasty, this skillet recipe is a simple and delicious way to prepare flank steak...and the flavorful sauce is absolutely divine! Recipe published courtesy of Campbell's Kitchen. 1. Heat 1 tablespoon oil in a 10-inch skillet over medium heat. 4. Heat 1 tablespoon butter and the remaining oil in the skillet. 5. Add the mushrooms and cook for 5 minutes or until tender, stirring occasionally. 6. Add the shallot, garlic and rosemary and cook and stir for 30 seconds. 7. Stir in the concentrated broth, water and remaining butter and cook until the butter is melted. 8. Cut the beef diagonally against the grain into thin slices. 9. 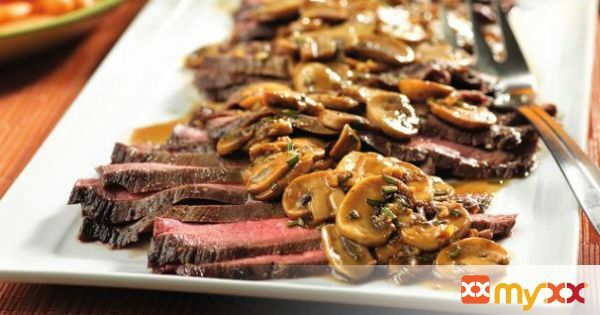 Serve the mushroom mixture with the beef.